Picking struggling retail stocks hoping for a rebound can be dangerous. Here are two I would avoid at all costs. Investing in retail stocks isn't for the faint of heart. It can be very difficult to understand if and when a retail company has a competitive advantage that will last years or if it will be made irrelevant overnight. While some retailers have boasted great business success for investors over the long haul, here are two retail stocks that I would advise investors to avoid at all costs. 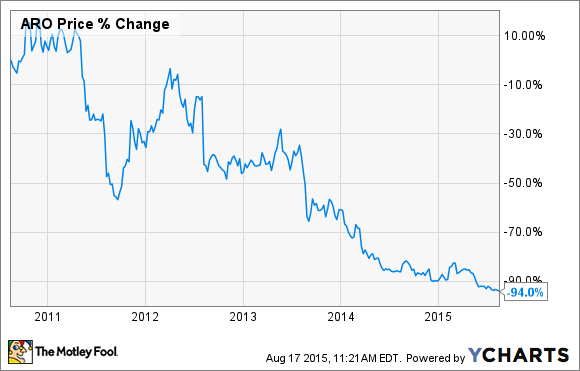 To say that Aeropostale has disappointed investors would be an understatement. Mall traffic has declined in recent years and the company operates in a highly promotional and competitive teen retail environment where consumer demand for logo-based clothing has waned -- pretty much a recipe for disaster for Aeropostale investors. For the first quarter of fiscal 2015, Aeropostale's net sales declined a whopping 20% to $318.6 million from $395.9 million last year. During the same time frame, the company's comparable-store sales, including the e-commerce channel, declined 11%. It gets worse. The company reported a $45.3 million net loss for the first quarter of fiscal 2015 and ended the quarter with only $76 million in cash and cash equivalents. Ouch. As it continues to struggle, it has accelerated the number of Aeropostale store closings from 20 in 2012 to 38 in 2013 and 122 during 2014. Aeropostale is anticipating it will shut the doors on another 50 to 75 stores in 2015 as it desperately tries to repair its brand image and improve store productivity. Aeropostale's main competition, Forever 21 Inc. and H&M Co., offer fashionable teen clothing at cheaper prices, and until it can figure out how to revive its brand, Aeropostale is a retail stock worth avoiding at all costs. Another retailer that finds itself in the struggle zone this year was once an American retail icon. Sears has taken a beating from just about every angle possible. It has to compete with brick-and-mortar retail king Wal-Mart as well as Best Buy, with its renewed focus in appliances. Heck, Sears doesn't even get room to breathe with its e-commerce as Amazon continues to dominate online sales. Source: Sears Holdings Q1 presentation. With fewer consumers shopping at Sears, it has been forced to pull tricks out of its sleeve to fund its survival. Last year, it spun off its Lands' End subsidiary, sold the majority of its stake in Sears Canada, and even sold roughly 235 of the company's Sears and Kmart stores to Seritage Growth Properties, which would lease the stores back to Sears. Unfortunately, these tricks are merely a Band-Aid at best. By pulling those moves, Sears estimates it has boosted liquidity to about $3 billion, which is about three times higher than what it had at the end of the first quarter of 2015. However, it plans to use $1 billion of that liquidity to pay down debt, and the remaining $2 billion seems much less promising when investors consider Sears' operating cash flow was negative $1.4 billion in 2014. Looking at Sears' adjusted EBITDA results, the company was quick to point out that it's posted three consecutive quarters of year-over-year improvement. While that's true, the truth is that Sears has been performing poorly in the grand scheme regardless, as you can see below. Sears faces tough competition online and at its brick-and-mortar stores, in addition to decreased mall traffic. Its comparable-store sales are suffering, and it owns an unpleasant balance sheet with little cash and liquidity that looks to be burned through pretty quickly. Sears is certainly a retailer stock that I'd avoid at all costs.